It had been a few months between holidays and, getting restless, Kirsten suggested a last minute cruise she’d seen on sale. I started dreaming of all the meals we’d be eating without needing to prepare, shop, cook or clean up and without much hesitation, I was in. The cruise was a 12-day South Pacific jaunt aboard the Carnival Spirit, departing and arriving back to our home city of Sydney which we believe to be one of the most gorgeous ports in the world. I must admit we were both cautiously optimistic about our decision. We’d seen the likes of P&O, Carnival and various equivalents leave Sydney packed with Aussies, and having experienced a luxury European river cruise on Scenic and an upmarket Cunard cruise aboard Queen Elizabeth, we weren’t sure if the ‘big fun ship’ was our style. Thinking ahead wistfully about the work and housework we’d enjoy NOT doing for 12 whole days and nights, we were totally on board (so to speak) with the trip to Noumea, Mystery Island, Denarau, Suva and finally Mare aboard a floating hotel. Apart from Fiji, these were new discoveries for us, some new world experiences for these two travel lovers. 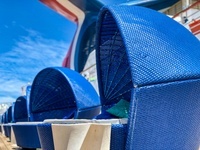 The Carnival Spirit, playfully referred to as the Fun Ship, holds approx. 2400 passengers and 930 crew. We boarded at around midday on what can only be described as a dream experience of Customs, going straight from being dropped off directly outside the passenger terminal at Circular Quay, to getting our bags taken off our hands before entering the building and breezing through the customs checks and scanners, a quick check in to our room and onto the ship. 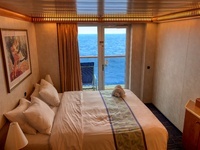 We could then go straight to our booked Stateroom where our room keys were sitting in a box at our door waiting for us. The best in Sydney, I’d say. We were all feeling festive and ready to escape the city on our adventure at sea. Once we’d slowly exited Sydney Heads, and waved goodbye to the pilot boat from our love-cabana for two, we headed back to the room to get ready for dinner, and discovered a slight glitch in the merriment – my bag was held up because I had a power board and apparently they are a no go onboard. We had to line up in some lower part of the ship along with all the other people with power boards, irons, or alcohol, all of which are not permitted, so we could open the locked bag and hand over the bugger. We were told we could request one of the ship’s own power boards should we need one, which we did. Go figure. You couldn’t take your own, but you could borrow one at no charge. 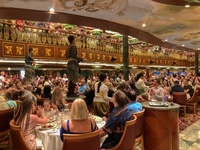 We experienced our first dinner in the main dining room and took ourselves on a tour of the Carnival Spirit. It’s hard to describe her interior as it’s not completely one style. It’s sort of a mish-mash of themed rooms, somewhat like the special hotel rooms you could hire back in the 80’s. Carnival calls it ”The World’s Great Architectural Styles”. You have the Empire Dining Room which is Egyptian with lots of gold and rich colours, and the Pharoah’s Room where the main shows are performed (also Egyptian themed). The Lido (buffet area) feels like sideshow alley and then there’s a jungle-themed walk, a Chinese themed bar (without Chinese food, or any food for that matter), a Japanese restaurant, an 80’s disco, and a couple of leadlight glass and dark wood detailed areas giving an old English pub feel. 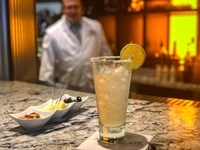 The main lobby and bar was small but packed a glitz punch of gold everywhere you looked, fresco’s on the ceiling and 3 glass elevators. It was like being in the Sistine Chapel inside Harrods. To top off our self-guided ship tour, we discovered the Casino, shopping alleys and picture viewing galleries all there to entice those precious dollars from your pocket on a day at sea, which of course didn’t feel like you were really spending because you were using a plastic room card to pay. We were fairly happy to find that the cocktails, beer and wine were all very reasonably priced, at pub prices rather than an upmarket bar or restaurant prices. However, if you didn’t want VB, Tooheys New or a couple of other Aussie beers, you were pretty much out of luck. They used to provide all-inclusive alcohol packages on this ship, or so we were told, but these days you can only buy an all-inclusive soft drink package. Not quite the same. I’m guessing that all-inclusive alcohol served to Aussies is a bad financial deal for the cruise line. In the evenings there is always a show to go to after dinner. While we were ready to be wowed delighted, the entertainment proved disappointing. There’s an onboard entertainment team which do their best but it’s a bit too “High School Musical” for this writer and his travel lover. They also have a Comedy Club inside the Versaille room. We dropped in for a PG performance and sadly we’ve never seen anyone bomb so badly, and we left before he finished his set. The Carnival Spirits best entertainment is from the wait staff, they are really fantastic and dance and sing every night while having dinner. It’s not uncommon for a dancing train to weave its way around the dining room, filled with both wait staff and fellow passengers. Even the Captain was most entertaining with a wry sense of humour and Eli, the cruise director, was brilliant. He’s a Kiwi and knows how to find the ironic and joke in situations. His ships talks were worth sitting in on. Sea days are always a good way to test a ships’ boredom factor. Luckily the Carnival Spirit have an adults-only area called “Serenity” at the rear of the ship as I previously mentioned. We’d get there just after breakfast to claim one of the round cane cabanas for 2, and while away many hours keeping shady and reading books while facing out to sea and feeling the fresh sea air. All good while the weather was fine. But after our Mare stop was cancelled due to a cyclone we couldn’t go to our haven and had to endure 4 straight days at sea, mostly indoors. We started to consider the possibility of swimming to shore. Any shore. These days proved difficult and consisted of towel folding demonstrations, bingo, trivia, secrets to a flatter stomach, and blackjack, not to mention more trips to the buffet out of sheer boredom – pretty common cruise activities. It had been a few months between holidays and, getting restless, Kirsten suggested a last minute cruise she’d seen on sale. I started dreaming of all the meals we’d be eating without needing to prepare, shop, cook or clean up and without much hesitation, I was in. The cruise was a 12-day South Pacific jaunt aboard the Carnival Spirit, departing and arriving back to our home city of Sydney which we believe to be one of the most gorgeous ports in the world. I must admit we were both cautiously optimistic about our decision. We’d seen the likes of P&O, Carnival and various equivalents leave Sydney packed with Aussies, and having experienced a luxury European river cruise on Scenic and an upmarket Cunard cruise aboard Queen Elizabeth, we weren’t sure if the ‘big fun ship’ was our style. Thinking ahead wistfully about the work and housework we’d enjoy NOT doing for 12 whole days and nights, we were totally on board (so to speak) with the trip to Noumea, Mystery Island, Denarau, Suva and finally Mare aboard a floating hotel. Apart from Fiji, these were new discoveries for us, some new world experiences for these two travel lovers. 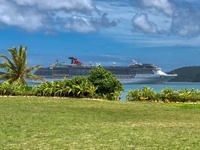 The Carnival Spirit, playfully referred to as the Fun Ship, holds approx. 2400 passengers and 930 crew. We boarded at around midday on what can only be described as a dream experience of Customs, going straight from being dropped off directly outside the passenger terminal at Circular Quay, to getting our bags taken off our hands before entering the building and breezing through the customs checks and scanners, a quick check in to our room and onto the ship. We could then go straight to our booked Stateroom where our room keys were sitting in a box at our door waiting for us. The best in Sydney, I’d say. We were all feeling festive and ready to escape the city on our adventure at sea. Once we’d slowly exited Sydney Heads, and waved goodbye to the pilot boat from our love-cabana for two, we headed back to the room to get ready for dinner, and discovered a slight glitch in the merriment – my bag was held up because I had a power board and apparently they are a no go onboard. We had to line up in some lower part of the ship along with all the other people with power boards, irons, or alcohol, all of which are not permitted, so we could open the locked bag and hand over the bugger. We were told we could request one of the ship’s own power boards should we need one, which we did. Go figure. You couldn’t take your own, but you could borrow one at no charge. We experienced our first dinner in the main dining room and took ourselves on a tour of the Carnival Spirit. It’s hard to describe her interior as it’s not completely one style. It’s sort of a mish-mash of themed rooms, somewhat like the special hotel rooms you could hire back in the 80’s. Carnival calls it ”The World’s Great Architectural Styles”. You have the Empire Dining Room which is Egyptian with lots of gold and rich colours, and the Pharoah’s Room where the main shows are performed (also Egyptian themed). The Lido (buffet area) feels like sideshow alley and then there’s a jungle-themed walk, a Chinese themed bar (without Chinese food, or any food for that matter), a Japanese restaurant, an 80’s disco, and a couple of leadlight glass and dark wood detailed areas giving an old English pub feel. The main lobby and bar was small but packed a glitz punch of gold everywhere you looked, fresco’s on the ceiling and 3 glass elevators. It was like being in the Sistine Chapel inside Harrods. To top off our self-guided ship tour, we discovered the Casino, shopping alleys and picture viewing galleries all there to entice those precious dollars from your pocket on a day at sea, which of course didn’t feel like you were really spending because you were using a plastic room card to pay. We were fairly happy to find that the cocktails, beer and wine were all very reasonably priced, at pub prices rather than an upmarket bar or restaurant prices. However, if you didn’t want VB, Tooheys New or a couple of other Aussie beers, you were pretty much out of luck. They used to provide all-inclusive alcohol packages on this ship, or so we were told, but these days you can only buy an all-inclusive soft drink package. Not quite the same. I’m guessing that all-inclusive alcohol served to Aussies is a bad financial deal for the cruise line. In the evenings there is always a show to go to after dinner. While we were ready to be wowed delighted, the entertainment proved disappointing. There’s an onboard entertainment team which do their best but it’s a bit too “High School Musical” for this writer and his travel lover. They also have a Comedy Club inside the Versaille room. We dropped in for a PG performance and sadly we’ve never seen anyone bomb so badly, and we left before he finished his set. The Carnival Spirits best entertainment is from the wait staff, they are really fantastic and dance and sing every night while having dinner. It’s not uncommon for a dancing train to weave its way around the dining room, filled with both wait staff and fellow passengers. Even the Captain was most entertaining with a wry sense of humour and Eli, the cruise director, was brilliant. He’s a Kiwi and knows how to find the ironic and joke in situations. His ships talks were worth sitting in on. Sea days are always a good way to test a ships’ boredom factor. Luckily the Carnival Spirit have an adults-only area called “Serenity” at the rear of the ship as I previously mentioned. We’d get there just after breakfast to claim one of the round cane cabanas for 2, and while away many hours keeping shady and reading books while facing out to sea and feeling the fresh sea air. All good while the weather was fine. But after our Mare stop was cancelled due to a cyclone we couldn’t go to our haven and had to endure 4 straight days at sea, mostly indoors. We started to consider the possibility of swimming to shore. Any shore. These days proved difficult and consisted of towel folding demonstrations, bingo, trivia, secrets to a flatter stomach, and blackjack, not to mention more trips to the buffet out of sheer boredom – pretty common cruise activities. Our Stateroom was fitted with full glass doors leading to a small balcony, so being on Carnival Spirit docked in Sydney harbour on a sunny day feels superbly luxurious. This was a great start to our experience and we were full of positivity for the 12 days and nights that lay ahead. We headed straight to deck 9 where the adults-only Serenity outdoor pool lounge was already filling with music and happy campers (ok, happy cruisers) enjoying a drink and a magnificent view.